The new issue of Kamuke magazine is now available. Produced and published by Cameron Murray of Sydney, Australia. Kamuke is a beautiful, glossy mag featuring some of the colorful personalities that play our beloved instrument. 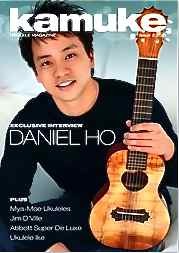 The new issue of Kamuke features an exclusive interview with six-time Grammy winner Daniel Ho, a profile of prestigious uke maker Mya-Moe, informal chats with yours truly, and Canadian songbird Shelley O’Brien, plus a look at the remarkable life of Ukulele Ike. You can purchase your collector’s copy for a mere $10.